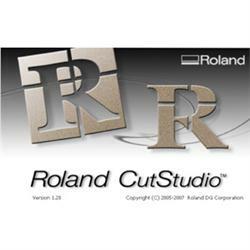 Roland’s powerful CutStudio software provides the necessary tools to design and create professional custom cut graphics for a wide range of applications. The Roland part RASD-CSWIN-01 is bundled with purchases of new CAMM-1 GX and Stika SV vinyl cutters. The software is compatible with all older Roland cutters. Click here to check for driver compatibility before purchasing the software. Please note that replacement copies are not available if the software disc is lost. There are no refunds on software products.